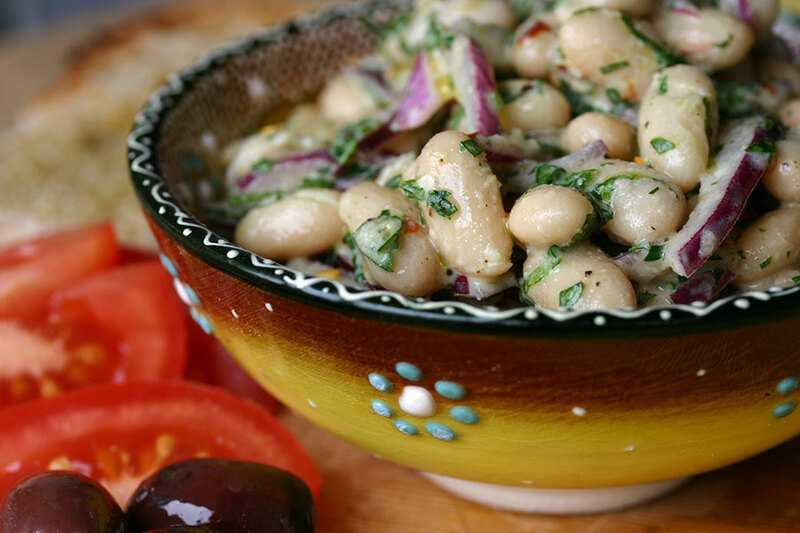 Piyaz is a traditional Turkish bean and onion salad, typically garnished with slices of tomato and hardboiled egg. The recipe varies from region to region – in Antalya they add tahini to the dressing, which gives it a pleasing mellowness. Having looked at a number of versions, I decided to use somewhat less vinegar than is usually called for. The dressing is still pretty sharp – the red onion provides a welcome sweet counterpoint. Place the sliced onion in a small bowl. Sprinkle with the salt, and rub it into the onions. Leave for ten minutes, then rinse and pat dry. Tip the cannellini beans into a colander, rinse and drain well. In a large bowl, mix together the beans, red onion, chilli flakes and parsley. In a small bowl, whisk together the tahini, lemon juice, vinegar, garlic, olive oil, salt and pepper. If the dressing seems too thick, add a little water to thin it to a pourable consistency. Carefully toss the salad with the dressing, then leave it for fifteen minutes or so for the flavours to marry. Adjust the seasoning and serve, garnished with tomato and slices of hardboiled egg. oh wow i wanna try this one! You are most welcome, Marie — I’m so pleased you like it!